Seedai,these crispy balls are traditionally prepared during Gokulastami festival. Usually i make uppu seedai which goes for the savoury version and dunno why i never tried making sweet seedais. 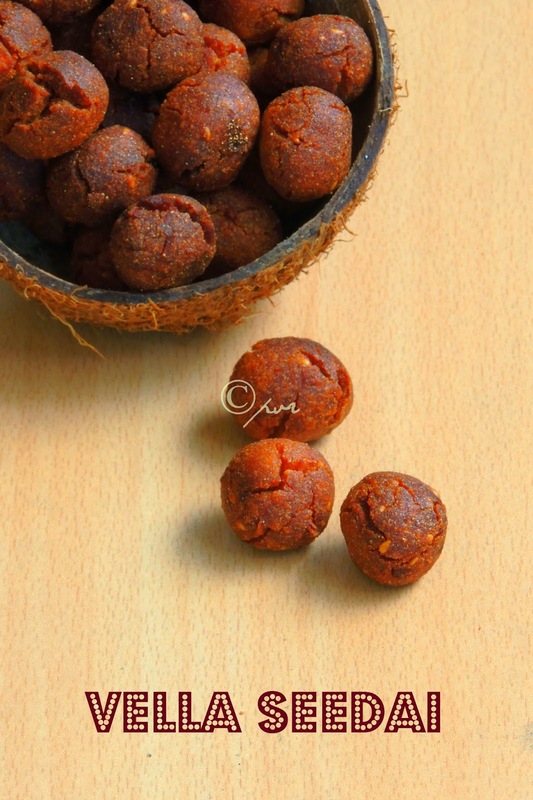 Making seedais at home is definitely a tricky one, the most freaky part is while frying these balls coz sometimes they can burst. Actually all depends upon the rice flour you go for making this crispy balls.Either homemade or store bought rice flour, you need to sieve and dry roast rice flour in simmer until a nice aroma comes from, then you can proceed making the balls which you need to dry a bit by spreading them over a paper towel or over a muslin cloth to remove the moisture of these balls, if you follow these both methods am sure your seedais wont burst at all. I learned everything by my experience, obviously after so many flops one can learn by themselves na. For our this month's Indian Cooking Challenge,a monthly event where we cook dishes from various regions of India.For this month's challenge, Srivalli gave us to cook both uppu seedai and vella seedai, but i picked the sweet seedai to cook for this month's challenge, finally i prepared these dangerously addictive sweet deep fried balls at home. They came out extremely prefect, we couldnt stop munching them.Thanks Valli for pulling me to make these sweet version. Dry the rice flour in simmer until a nice aroma comes from. Melt the jaggery with enough water and strain it. Bring boil the jaggery , measure it as 3/4th cup and keep aside let it cool. Dry roast the grated coconut until they lose their moist. Dry roast the sesame seeds until they turns slightly brown. Take the roasted rice flour,cardamom poder, dry roasted coconut, dry roasted sesame seeds in a bowl. Gradually add the jaggery syrup and turn everything as a soft dough. Grease your palm and make small round medium sized balls out of this dough. Let them dry for few minutes over a paper towel or on a muslin cloth atleast for half an hour. Heat oil for deepfrying, drop the balls one by one, fry in small batches. Once the balls turns deep golden brown, remove it from oil. Strain the excess oil with paper towel. Arrange it in an air tightened box. love cheedai in any form salt or sweet. Nice color. Wow Priya, your vella seedai has come out so well!.. I know these are tough to make. They seem so good! Delicious! I've not tried my had at making cheedais so far... i'm a big fan of the uppu cheedais :) but these look so delicious and have the perfect color. Love these little things! Would love to have some! These swert balks look tricky to make but must have tasted amazing. I have never had Vella seedai before. I like the use of rice flour, coconut and jaggery. I am sure they must taste great . I have always been wanting to try these vella Seedai.. will book mark them to be made soon. A tempting, crisp, and delicious little balls...love this as a fave new snack! 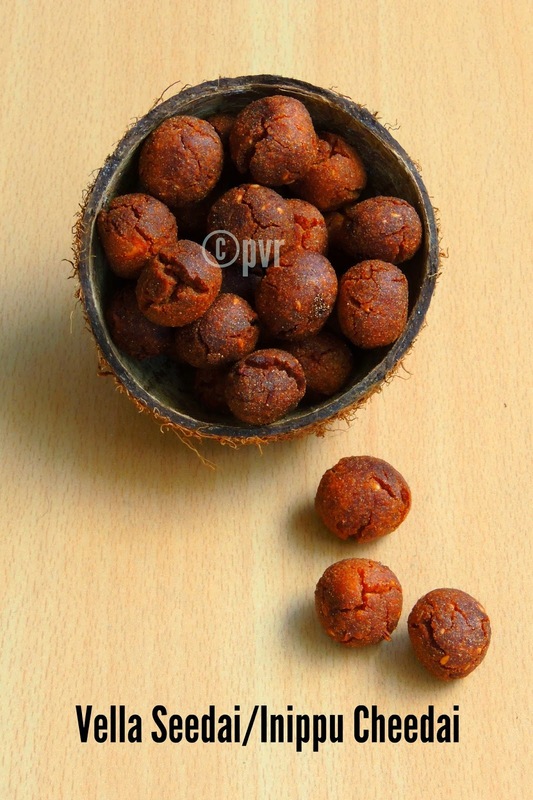 Love these Priya, but I have never tried making it, scared of the bursting part, but am going to try soon..
You reminded me of Krishnashtami, yummy little balls!